Stage Stallone, 36, was found dead in his L.A. apartment on July 13. He was laid to rest on Saturday morning at a private memorial service for family and friends. 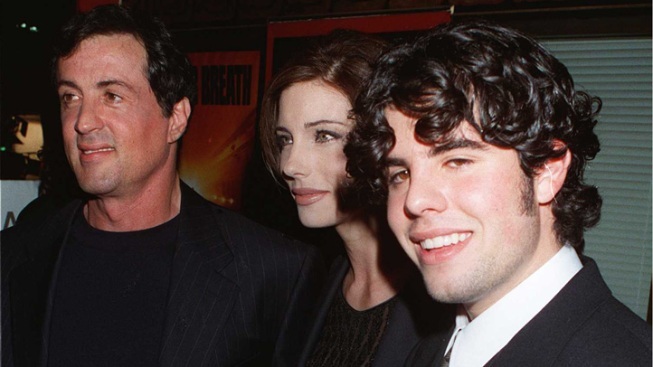 Sylvester Stallone and ex-wife Sasha Czack laid their son, 36-yea-old Sage Stallone to rest on Saturday morning, US Weekly reported. Family and friends gathered at St. Martin of Tours Catholic Church in the upscale Brentwood are of Los Angeles to pay their respects, according to E! News. Sage was found dead in his L.A. apartment on July 13. The cause of death has yet to be determined pending the results of toxicology tests, though police do not suspect foul play. "When a parent loses a child there is no greater pain," the 66-year-old "Rocky" star said in a statement about his son, a filmmaker and actor. "Therefore I am imploring people to respect my talented son's memory and feel compassion for his loving mother Sasha." As a child, Sage starred with his dad in "Rocky V."
Czack had previously requested that, in lieu of flowers, mourners make a donation to Autism Speaks, E! reported. Sage's younger brother Seargeoh is autistic. Though those who knew him said he was prone to anxiety at times, close friend Stephen Wozniak told E! he does not believe Sage took his own life. “He was a wonderful guy who loved life and was so sensitive that it got to him," Wozniak said.